An easy recipe resulting in a moist, rich cake - also suitable for christenings and weddings! Preheat the oven to 150°C, gas mark 2. Grease and line the base and sides of a 23cm-round or 20cm-square cake tin with baking parchment so it stands 5cm above the top. Use string to tie a double thickness of baking parchment around the outside of the tin. This will help prevent the cake drying out during cooking. In a large bowl, use a hand-held electric whisk to beat together the butter and sugar until pale and fluffy. Gradually beat in the egg, a little at a time. If the mixture begins to curdle, add a spoonful of flour with the last few additions of egg. Add the soaked fruit and walnuts, with any remaining liquid, then mix well. Fold in the rest of the flour. 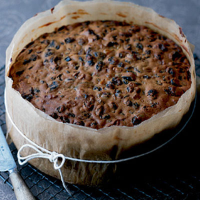 Spoon into the cake tin, then use a round-bladed knife to level the top of the mixture. Stand the tin on a tray and bake for 3-4 hours until cooked through, covering the top of the cake with foil if it starts to over-brown. To check that the cake is cooked, insert a skewer into its centre – if the skewer comes out clean the cake is cooked. Leave to cool completely in the tin. Look for Christmas Cake Decorated on how to ice this cake.